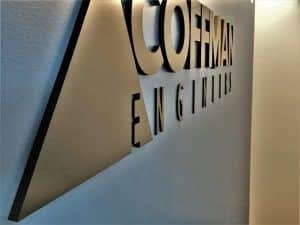 Coffman Engineers is a structural engineering company that recently opened a new location in San Diego, California. 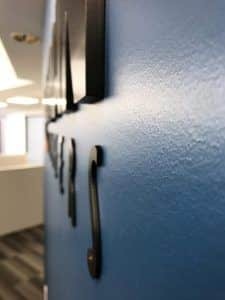 Like a lot of offices, they wanted a visually impactful display of their logo in the lobby area. When we start on any sign job, the first thing we look at is what will be going on the sign. With logo wall signs, we think about the best way to display the elements of their logo while getting the opinion of what the client wants, and where the sign will be going. When a logo is being made, it is usually for print or web so it’s our job to consult with clients and figure out how to make their logo into a 3-dimensional display. Their logo is made up mostly of letters so a dimensional letter sign was the first choice. Their interior wall was already painted their company color so they wanted the sign itself to be a dark gray color. When a material doesn’t come in a color a client wants, we opt for acrylic dimensional letters. We can paint acrylic dimensional letters any Pantone color and we have many options for the finish. For this sign, we used a semi-metallic gray. 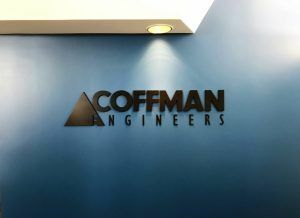 They wanted the letters to be fairly thick so we made “COFFMAN” and the triangle from 1/2″ thick acrylic. The “E” in “ENGINEERS” is incorporated into the triangle logo so we made the triangle first, and cut the “E” out. They didn’t want the whole sign to be 1/2″ thick so the rest of the letters, “NGINEERS”, was made from 1/8″ thick acrylic. This creates an interesting dynamic and puts more focus on the main part of the logo. The sign was installed underneath an existing light. This creates a great shadow effect underneath some of the thicker letters. When you start thinking about starting any sign project, the first thing you decide is where the sign will go and how much space you want it to take up. Some offices have walls that are perfect for displaying an interior sign. A lot of companies will also install a lobby sign of their logo above the reception desk if they have one, so it is the first thing a customer sees when entering the business. Your logo is a crucial part of your brand identity so we try our best to make sure that your company is represented as it should be. If you’re ready to start a lobby sign project with us, you can request a quote here.